Britain's "first past the post" voting system could be scrapped if Labour wins the general election, under plans which have been outlined by Gordon Brown. The prime minister wants a referendum on changing to an "alternative vote" system, where candidates are ranked in order of voters' preference. MPs will vote next week on holding a referendum after the general election. The Tories accused the PM of wanting to "fiddle" the system while the Lib Dems said the plan did not go far enough. Mr Brown told his cabinet that the proposals for voting reform formed part of a commitment to constitutional change stretching back to the start of the Labour administration. He said it took in devolution, freedom of information and House of Lords reform. Voters rank candidates in order of preference and anyone getting more than 50% in the first round is elected. In a speech in London, he announced that a referendum on changing the longstanding Westminster voting system could be held by the "end of October 2011" if the idea was approved by MPs. Mr Brown said the alternative vote system (AV) would offer voters more choice and give all MPs a "clear and strong mandate", while keeping a link to their constituency. "It means that each elected MP will have the chance to be elected with much broader support from their constituency, not just those who picked them as their first choice. "In short it offers a system where the British people can, if they so choose, be more confident that their MP truly represents them, while at the same time remaining directly accountable to them." Mr Brown also backed proposals by Labour MP Tony Wright to beef up the power of MPs to hold the government to account, with elected select committee chairmen and control of what is debated at Westminster handed to a backbench committee. He said the government also backed e-petitions, which would allow members of the public to suggest topics for MPs to debate and said voters would get the right to recall MPs guilty of financial impropriety, where the House of Commons had refused to act. Mr Brown restated his commitment to a written constitution for the UK and said he had asked the Cabinet Secretary "to lead work to consolidate the existing unwritten, piecemeal conventions that govern much of the way central government operates under our existing constitution into a single written document". He also announced the setting up of what he hoped would be a cross party group to decide if a British Bill of Rights and Responsibilities was needed, which he said should reach a conclusion by 2015 - the 800th anniversary of the signing of the Magna Carta. Labour pledged a referendum on electoral reform in its 1997 election manifesto but the idea was kicked into the long grass by Tony Blair after his landslide victory. Quizzed by Tony Wright, chairman of the public administration committee, on why he had chosen to act now, Mr Brown said that with damage to Parliament's reputation over the past year "it seemed to me that we had to reach a conclusion on where we could go". Mr Brown said there was no "perfect" voting system but he had chosen to back AV, rather than a more "proportionate" system, because he believed MPs should retain their constituency link. Mr Brown also said told the Commons liaison committee he was in favour of lowering the voting age "but it would be better combined with better citizenship education and people assuming citizenship at that age". The Liberal Democrats say the AV option is "a small step in the right direction" but not a substitute for a fully fledged proportional system. "If they agree it, this is a death-bed conversion from a party facing defeat at the general election," said its home affairs spokesman Chris Huhne, confirming the party would put forward its own amendment. The Conservatives are strongly opposed to replacing the current "first past the post" system, saying it results in stable governments. "Gordon Brown avoided a leadership election, bottled a general election and now wants to fiddle the electoral system," said Conservative chairman Eric Pickles. 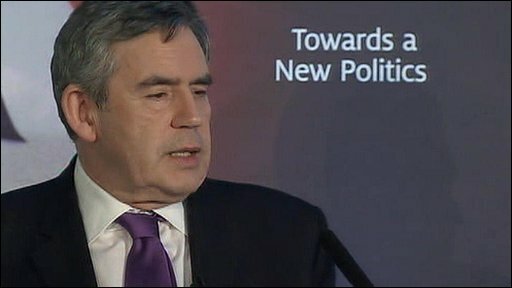 Campaigners for democratic reform give a mixed reaction on Mr Brown's proposals, with some, such as Power 2010 saying it did not go far enough: "Without troubling the public for their views, ministers hand-picked the voting system they favour in a cynical exercise aimed at wrong-footing the Tories ahead of a likely election defeat. "The future of our democracy is far too important to be decided by empty gestures such as this." But the Electoral Reform Society urged all parties to back the proposals, arguing that "any improvement is worth having". And Unlock Democracy hailed Mr Brown's words as "the most radical speech on democratic reform given by any serving government minister since Lloyd George".